According to dictionary.com, archeology is defined as "The systematic study of past human life and culture by the recovery and examination of remaining material evidence, such as graves, buildings, tools, and pottery." 2 When we think of archeologists we often picture Indiana Jones dodging boulders, cracking whips, and searching for the Holy Grail. These scenes, although cinematic, are a far cry from what archeology really entails. Granted, archeology involves a lot of mystery, yet it is grounded in research that combines many scholarly disciplines ranging from linguistics and sociology to biology, chemistry, and physics. One of the primary goals of the archeologist is to date items, and excavation sites in order to place them in their historical context. There are several ways to do this. One of them is absolute dating methods, which give a numerical date. This does not mean they are 100 percent accurate only that they provide a specific numerical date. The second is relative dating which does not give a numerical date, but provides information on how old an item is compared to other items. These methods don’t provide specific dates on their own but can be cross referenced with other methods to provide more reliable information. 3 For example, stratigraphy, the simplest archeological technique, looks at how deeply items are buried. Dirt accumulates over time covering artifacts and buildings. So it makes sense that the more dirt covering an item the older it is. This is not a precise method and only tells the archeologist if an object is older or younger than another item at the same site based on whether it came from a deeper or shallower layer of dirt. 4 Others methods are becoming more and more rigorous as hard science starts to play a stronger role in dating artifacts. Biology has contributed immensely in this respect. One way scientists can date sites and get an idea of the area’s weather patterns is by taking samples of tree cores. With a small tool they can remove a sliver of a tree and analyze the number of rings and their thickness - a method called dendrochronology. The number of rings tells the scientist the age of the tree and their thickness indicates whether the year was wet or dry. 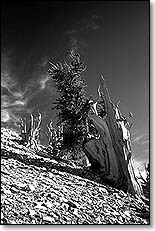 Bristlecone pines, for example, live for nearly 5,000 years, and data from their tree rings has been used to create a reliable chronology for the Southwest. Dating from dead trees helps to extend the time line. 5 Biology gives us a few other methods as well. Palynology, the study of pollens, studies the types and amount of pollen in a site which can then be compared to the history of the area’s vegetation to produce a date for a site or layer in a dig. Below is a picture of a grain of pollen from an Olneya tesota tree and a picture of the tree itself. 6 Fluoride absorption is an advanced biological technique, although it is a relative dating technique. Any bone buried near groundwater or with high fluoride content in the soil will absorb fluoride at a fixed rate until it is saturated. This method has its limitations, however, since a bone can absorb only so much fluoride and soil chemistry can vary immensely. This method works best within a single site with uniform fluoride levels in the soil to provide relative ages for bones. 7 Notice that many of the methods described above mix knowledge of biology with that of chemistry. In fact, chemistry, even more than biology, is an indispensable tool for an archeologist. One of the most important dating tools archeologists use is Carbon-14 dating (C-14). All living organism maintain a C-14 equal to the carbon levels in the atmosphere. After death, C-14, a unstable radioactive element, decays into a more stable form, C-12, at a fixed rate. Thus, the ratio of radioactive carbon to non-radioactive carbon after a given period of time can indicate the age of an object. Its accuracy came under scrutiny because of the relative novelty of the process. Despite the method’s questionable credibility, many advances have been made in perfecting this technique over the last 50 years. First, the amount of carbon in the atmosphere during a given year can be tested by analyzing tree cores. Radiocarbon dating is an absolute dating method and provides dates for items between 200-50,000 years old. Using this information, scientists have created a new calibration allowing them to account for fluctuations in global carbon levels. One problem with the original C-14 dating method was that it relied on reading radioactive emissions. A new technique, accelerator mass spectrometry dating, counts the radioactive atoms themselves, allowing for sample sizes up to 1000 times smaller than conventional C-14 samples. 8 There are other methods that depend on radioactive samples as well. Potassium-argon dating can be used to date volcanic materials between 50,000 and 2 billion years old. It was used to date materials from Olduvai Gorge (2100,000 to 15,000 years old) where some scientists theorize man originated. 9 Another method helpful in dating involves drilling deep into the ice of Antarctica. These glacial ice cores contain many trace elements that can give scientists clues as to how atmospheric content changed over time. A layer of ice with a particularly cloudy composition may represent a major volcanic eruption. Scientists used just this kind of information to date (circa 1650 BC ) the eruption of the volcano Thera on the island of Santarini near Greece. 10 Physics also supplies archeologists with a few tools. Fission track dating was developed about 40 years ago by a group of American physicists. They found that minerals or glasses that contained uranium would accumulate micrometer-sized damage tracks that would accumulate at a fixed rate. These tracks can be used to date objects between 20,000 and 2 billion years old. 11 Thermoluminescence dating is a new and intriguing method. Although it is not extremely accurate yet, it works well for objects between 300 and 100,000 years old. Thermoluminescence dating is used for rocks, minerals and pottery. It depends on the fact that almost all natural minerals are thermoluminescent, meaning that when they are heated they produce light. Energy absorbed from ionizing radiation frees electrons to move through the crystal lattice, and some are trapped at imperfections. Later, heating releases the trapped electrons, producing light. 12 Measurement of the intensity of the luminescence can be used to determine how much time has passed since the last time the object was heated. The light is proportional to the amount of radiation absorbed since the material was last heated. Natural radioactivity causes latent thermoluminescence to build up, so the older an object is, the more light is produced. These dates are now being used to determine when the first human colonization of Australia occurred 53,000 to 60,000 years ago. 13 Finally, physicists use the earth's magnetic poles to determine the age of objects. Over time the earth’s magnetic pole shifts slightly affecting the alignment of magnetic fragments in rock or clay. When clay is cooked at high temperatures to harden it, the iron particles in the clay are reset to point towards the current magnetic north. Scientist can then tell the last time a fire pit with clay was heated. Although this is useful, it can be applied only to changes occurring over a wide span of time and is not very helpful for studying modern humans. 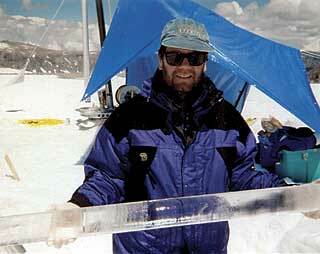 (Below is a picture of an archeologist using probes to sample for magnetic dating information). 14 None of these methods by itself can paint the entire picture of our past. However, by using several different methods, combining context, and cross-dating, the archeologist can piece together the details of history. Absolute dating methods in conjunction with relative dating methods make dating more reliable. Biology, chemistry, and social science each provide separate methods for dating materials. Every year, new and more creative methods of dating are emerging that fill in even more of the gaps and make our chronology even more dependable. At an archeology dig site, four pottery items were found. A flower pot was found at a depth of 10.8 feet, a water bowl was found at a depth of 10.3 feet, a dinner plate was found at a depth of 10.9 feet, and a drinking cup was found at a depth of 10.5 feet. Which list orders the pottery items from oldest to newest? and one half-life equals 5,730 years. The remains of an early Spanish settler were found in St. Augustine. Based on his bone structure and height, it is speculated that 6.5 micrograms of C-14 were originally present when he died. Historical records tell us that approximately 0.07 half-lives have passed since his death. How much C-14, measured in micrograms, should be present when his remains are tested? Using the formulas given, find the number of years that would have elasped if n = 0.11 (the number of half lives) and the number of years in a half life is 5,730. Which of the following terms might relate to the term “Stratigraphy”? Which of the following dating methods all make use of chemistry and/or biology to prove history? If a museum was given an object from an archeological dig and only that object was available for study, what method might scientists use to discover its age?